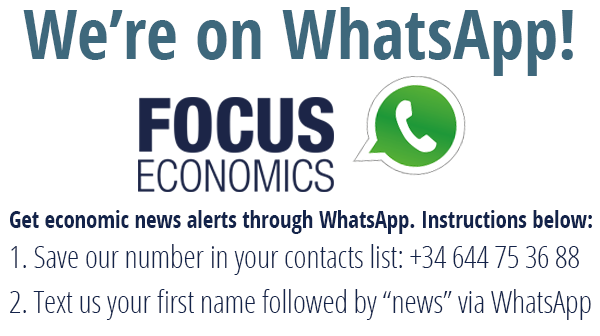 FocusEconomics: Considering President Putin is widely expected to win the upcoming elections, do you see any economic consequences from the vote? Investors and local society do not foresee any intrigue in the elections where Mr Putin is widely expected to win another term. So, the outcome is priced in, and thus there should not be any short-term impact. Yet, the focus is on any post-election decrees for the government like in 2012, setting the economic policy agenda. In his address to the Federal Council in March, Putin outlined all major priorities for social and economic development; therefore the key question is how they will be embedded into the budget and what the financing sources will look like. This will clearly affect the mid-term outlook for the economy, which is now expected to grow only by a subdued 1.5-2% a year. Dmitry Polevoy: What is your outlook for the Russian economy this year? Since Jun 2017 we have been expecting 2% GDP growth in 2018 and see no reasons to revise it down. Why? We count on the positive effects of public wage increases (under the May 2012 post-election decrees) and retail leading an expansion in consumption as consumer confidence is at pre-crisis peaks. Investments should also benefit from lower post-election political uncertainty and easing financial conditions due to continuing CBR rate cuts and rising structural liquidity surplus. Exports should also be a positive contributor with higher GDP growth of Russia trade partners and relatively stable real exchange rate under the new fiscal rule, which clearly benefits non-energy and services exports. So, 2018 should be a good year for the economy, but key question is what will be next? FE: What are the main risks for your outlook? DP: We would outline two major risks. The first one is if Putin decides to stick to a “no major reforms scenario” or if the announced measures do not provide any visible positive momentum for economic activity. Low economic growth and nearly stagnating incomes may challenge political stability over Putin’s next term. The second risk is external, stemming from continuing geopolitical tensions and possible negative global markets developments. The oil price is still a factor, but to a much lesser extent because the new fiscal rule makes the budget, RUB and economic activity much less sensitive to oil price swings. FE: In Putin’s recent State of the Nation address, he stated that he will pursue a number of ambitious spending projects. Has this affected your forecasts at all? We haven’t factored in the new initiatives in our current and mid-term forecasts. We need to have more clarity about specific measures and their financing sources to adjust forecasts. The new round of macro and budget forecast revisions will clearly help to shed more light on the issue. FE: What is your projection for the government’s fiscal balance this year? Why? DP: That is a very easy question. The fiscal rule provides nearly all major inputs for fiscal balance calculations. Our analysis assumes that the budget breakeven oil price is around US$55/bbl, so under ING's base-case forecast on Brent of US$60/bbl we expect a fiscal surplus of around 1% of GDP. And even if the oil price drops to the budgeted US$44/bbl, the fiscal gap will be close to 1%-1.3% of GDP which is fully manageable. Any increases in spending may only come from higher non-oil revenues, so the overall system will remain balanced. FE: Do you think we will see a tightening in U.S. sanctions? It is impossible to precisely predict what politicians may do in the future, so for now we make a very simplistic assumption that everything will stay the same with no extra sanctions with economy-wide implications. There might be some additional sanctions against individuals and even some corporates, but for now the potential negative effects look moderate with the economy now being much more resilient to sanctions than at the initial stage. FE: Do you think the Russian Central Bank will continue to ease rates? When do you expect an end to the cycle? DP: We are pretty confident that the policy easing will continue over 2018-2019 with the key rate likely falling to, at least, 6.50% in 2018 and 5.75% in 2019 as the CBR continues policy normalization. What investors should look for next is the potential downward revision in the inflation target from the current 4% and/or the narrowing or reduction of the CBR estimate of the neutral rate of 2%-3%, which may all see some extra room for policy easing in the years ahead. But it is too early to play now. FE: Do you think we will see another extension of the OPEC oil cut deal? What is your outlook for oil prices and the energy sector in Russia? DP: We don’t have a clear view on what could be expected when the current extension comes to an end. Our commodity team sees no clear case for the extension, so together with a rising oil supply from the U.S. all these drives ING in-house view of oil prices falling to US$55-60/bbl in 2H18 and closer to US$50 in 2019. Yet, even these levels look OK for the energy sector in Russia given that RUB exchange rate will be kept less sensitive to oil price levels due to the fiscal rule, so RUB/bbl oil price will likely stay at very comfortable levels for Russian oil majors. The Russian economy will be structurally further less dependent on oil, and this is the major thing markets should learn now. Dmitry Polevoy is Chief Economist for Russia and the CIS region at ING. Prior to ING, Dimitry worked at KIT Finance Investment Bank in Moscow and Gaidar Institute for Economic Policy. Dmitry holds a PhD in Economics from the IET and Master/Bachelor degrees in Applied Physics and Mathematics from Moscow Institute of Physics and Technology.